Kate Cowling (back right) education worker with Northumberland County Council and teacher Kathleen Ramsay with children from Ponteland First School. THE future is bright for hundreds of county residents of all ages thanks to an ambitious solar energy scheme. And Ponteland First School’s drive to save even more electricity has been rewarded with a national accolade. A total of 120 schools and community buildings have been fitted with between eight and 40 solar PV panels and it is estimated that each school will save approximately £590 a year on power. The Northumberland County Council project is accompanied by education work as an officer from the authority runs assemblies and class sessions to explain to pupils how solar power works and how they can reduce their energy usage. 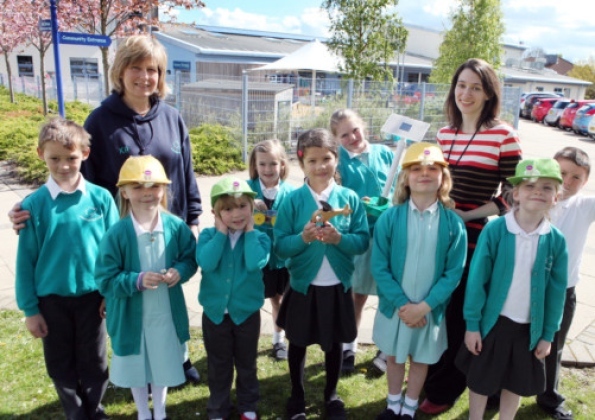 Ponteland First School has taken part in the scheme and it recently won a Gold Medal Award on EDF Energy’s ‘The Pod’ website for its efforts during Switch Off Fortnight. Kate Cowling, the county council’s education worker for solar PV and sustainability, said: “I visited the school to talk about its new solar panels and suggested some energy saving ideas. “Its Eco Council’s first action was to complete an audit of lights left on in school over lunchtime. Members also decided to write to parents explaining what the school was doing to save energy and parents and children were invited to send in their ideas on sun templates, which were then put up on display in the school hall. Other buildings benefiting from the panels include more than 500 residential properties managed by Homes for Northumberland, Northumberland Fire and Rescue stations, libraries, community centres and county council offices. The project has been delivered on behalf of the council by GB Renewable Energy and the authority will maintain the systems on all the properties for at least the next 25 years. Coun Roger Styring, deputy leader of the county council, said: “Combating the effects of climate change and rebalancing the economy of the county are key priorities for Northumberland.